Raanjhanaa – A breezy song which has Rahman stamp on it all over.. Infectious tune, terrific orchestration and wonderful singing all make this song a winner straightaway…. Concentrate on the violin and the sitar in the interludes that’s special…. Banarisiya – Stunning prelude to an even more startling voice in Shreya Goshal.. She carries the entire song with her delectable voice to aplomb, ably complimented by the support singers.. The tone of the song is mischievous and the instruments tease and connive with the singers giving the song a close to perfect fillip. Piya Milenge – Its Rahman’s turf here.. A song you can listen to without bothering much about the visuals.. Sukhwinder singh is top notch. Again Rahman’s orchestration deserves special mention cleverly blending classical and sufi to the background of some heavy rhythms. Aye Sakhi – Back to classical.. And Rahman doesn’t disappoint you. The four singers in Madhushree, Chinmayee, Aanchal Sethi and Vaishali lightheartedly sing the song and even go to the extent of imitating instruments. A song that more relies on the ghatam and the tablas to give that extra bit of charm to this song.. Will sound better with visuals. Nazar Laaye – “Blue” times and you will instantly like the tune. Rashid Ali is effortless and so is Neeti Mohan. It’s soft, light and pleasant on your ears. Will merit a repeat for the many romantics out there…. Tu Man Shudi – A weird prelude and Rabbi’s “rockstar” crooning catches your imagination almost immediately. The orchestration and the song pattern elevate the song in trying to be cult. The line “Humse wafaayein lena, Taaza hawaayein lena” is very catchy. Rahman experiments after a long time and comes out triumphs..
Aise Na Dekho – The weakest song in the album and how ironic that Rahman sings it himself. Perhaps the song could have been better with someone better behind the mike. After a few uninspiring albums Rahman returns with a bang.. Raanjhanaaa is not goose bump material but will stay on your mind for some time to come.. More so for his return to attempt to innovate and improvise, though not completely. 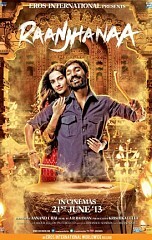 RAANJHANAA – Rahman is BACK!! This page has information about Raanjhanaanaa – RAahmANJHANAA! !, Raanjhanaa, AR Rahman.